They were brought together by garba. And a surprise trip to Venice took their relationship to the next level. A proposal under the Rialto Bridge, an engagement ceremony in India, and a grand wedding in Atlanta – Shruti and Hiren’s wedding is a fascinating fairy tale, indeed! 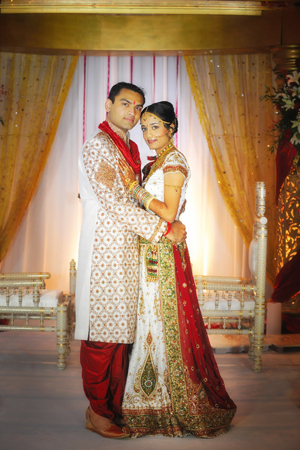 Thanks to Amit, a mutual friend of Shruti and Hiren Patel, the two met on a garba dance floor. They enjoyed many garba dances together for the years that followed. Long phone calls brought the duo closer, and the friendship kept blooming. A few months later, the two had an official engagement ceremony in India. Shruti and Hiren planned to tie the knot later in the United States, and it was only then that they realized the difficult task ahead. Both families agreed that Atlanta would be the best option. With only a few months to plan, it wasn’t an easy to find a venue that could accommodate the expected number of guests and also be available on the desired date. Finally, the couple chose Marriott Marquis in the heart of Atlanta. While the exterior of the hotel was not too impressive, the beauty of hotel’s Atrium Banquet Hall struck the couple. 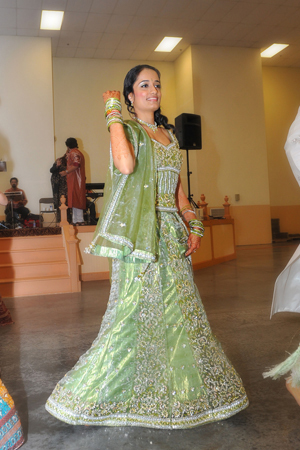 For the wedding, Shruti opted for a choli, which was adorned with green, red, and gold designs on a white background. The blouse was a corset style, boat neck, with short sleeves. Her jewelry was a mix of real gold pieces along with some additional matching pieces, all of which came from Gujarat. Hiren wore a dhoti salwar with red embroidery on a white background to match Shruti’s trousseau. Shruti’s hair was beautifully styled up for the ceremony. For the reception, she chose to keep her beautiful curls down and flowing. 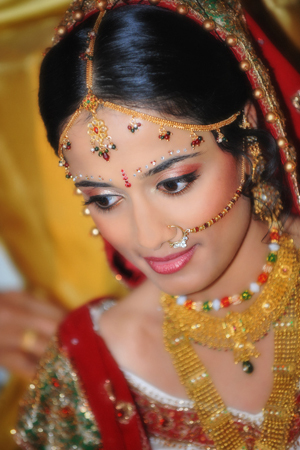 Traditional and elegant makeup gave a pleasing angelic touch to the beautiful bride. Aarti Amin, the hair and makeup stylist, is an expert in making brides look natural. As the couple’s love story began with garba, it was fitting that the duo organized the sangeet portion of the pre-wedding events as a raas garba. A garba singing group, which was from India on a tour around the US, added much life and festivity to the event. An aisle lined with pillars of vases embellished with fresh flowers including green goddess callas, hydrangea and roses, was displayed to welcome guests. A golden arch gate trailed up to a golden mandap draped with burgundy satin drapes on the face and gold sheer drape as the backdrop. The mandap also had a clear ceiling layered with a carpet of fresh rose petals. During the planning phase, the couple decided on a red and gold theme, but left the details to expert decorators from Shangri La, who suggested a peacock theme for the reception party. The professionals proved their worth, and the end result was much better than expected. For the reception party, tall vases with a beautiful arrangement of peacock feathers, gold curly willow branches, and fresh purple and blue orchids were displayed throughout the hall. Some tables were adorned with square transparent vases, all of which were filled with white orchids and teal colored water. A professional disc jockey set the mood for the party, and the couple’s friend, Charles, surprised all by becoming the emcee for the evening, making the night even more delightful! Performances by friends and family from both sides surprised one and all. With a beautiful amalgamation of dances and skits, friends and families truly showcased the love story of Shruti and Hiren. A special highlight of the ceremony was the way in which both Shruti and Hiren made their wedding entrance. Shruti arrived in a golden-ivory open doli, which was carried by her maternal uncles and brothers. Hiren’s arrival was no less royal. He arrived with the jaan in a full-fledged vargadho, followed by a wireless DJ and horse and carriage. Two downtown Atlanta streets were closed for two hours, and police escorted the groom as he was followed by a procession of friends and family dancing and enjoying every moment. Each and every guest left the magical event with a set of custom-made personalized shot glasses that double as candleholders. This was an ideal memento from the love-birds and their families to mark the auspicious day.